Technology. Digitization. Machine learning. Alternative Intelligence. Robotics. Big Data. Blockchain. Anthony Cowell, a Partner and Head of Asset Management for KPMG in the Cayman Islands and the chairman for CAIS19, kicked off the event by discussing the transformative potential of technology through the lens of three stories: Globalization, Digitization and Millennialization. Despite concerns over the downfall of globalization, the reality is that globalization isn’t slowing down — it’s just shifting. The biggest companies in the world today don’t sell a product; they sell information and knowledge. That means companies can have a digital presence, if not a physical presence, all over the world. Netflix is a perfect example of the new form of globalization because its data, which includes movies, TV shows and documentaries, is easily accessible from almost anywhere in the world. The reason that many believe digitization will become the “north star of the investment industry” is because of the rise in the scope and scale of data. Experts estimate that by 2025 there will be as much as 165 zettabytes of data, representing a tenfold increase, most of which will be unstructured data (i.e., satellite images, newsfeeds, social media posts, etc.). The rise of machine learning will allow people to make sense of this unstructured data, giving birth to a third wave of investing where humans and machines must work together. Finally, the growing influence of Millennials, the most tech-savvy generation (to date), is transforming how and why we interact with technology. From smartphones and drones to e-commerce and social media, technology increasingly dominates every aspect of daily life. But millennials aren’t satisfied with just any technology; they prioritize technology that offers ease of use, interconnectivity, and battery power. Millennials are also among the biggest proponents of responsible investing and sustainable consumption, and are not afraid to vote with their wallets by purchasing only from companies that they deem to be responsible corporate citizens. Each of the day’s panels and presentations could be tied back to one of these stories. Ian Bremmer (Eurasia Group) spoke about how increased competition over technology has sparked a potential Cold War between the U.S. and China in the fight for global supremacy. While the U.S. has better data scientists, China has more data, giving it an edge in the battle to define the next generation of AI and machine learning. Dr. Beth Healey talked about how her research on the effects of extreme environments, like Antarctica, on the human body and psyche could help inform future space missions to far-off places like Mars. A panel of data experts, including Michelle McCloskey (Man Group), Dr. Mark Jackson (Cambridge Quantum Computing), Christine Qi (Domeyard) and Dr. Mike Chen (PanAgora Asset Management), talked about the rise of machine learning and how achieving a better balance between human and machines can help unlock alpha opportunities. Bettina Warburg (Animal Ventures) talked about how blockchain technology is powering the shift to a decentralized economy in which transactions no longer require a middleman. Her co-founder, Tom Serres, shared his view on how the technology and infrastructure behind cryptocurrencies represented the greatest investment opportunity since the first industrial revolution. Three of the world’s leading robotics experts, including Dr. Magnus Egerstedt (Georgia Institute of Technology), Jianbo Lu (Ford Motor Company) and Steve Toebes (NextShift Robotics), discussed the threat that robotics pose to human labor and the need for a productive human-robot interface. Cowell summed up this sentiment in his opening remarks when he said “the future isn’t what it used to be.” As much as people like to try to predict the future, the rapid pace of technological change means that they’re likely to be wrong. Likewise, the alternative investment industry is also in the business of trying to predict the future, an increasingly tall task for even the best of investors. The lesson is that it’s more important than ever to “anchor” ourselves to a digital future by constantly adapting to both expected and unexpected technological advances. 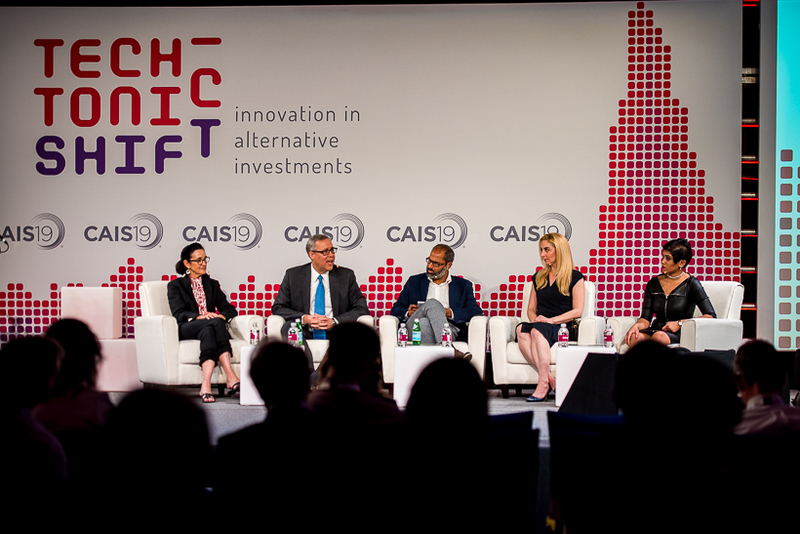 Check back on the CAIS blog and by following #CAIS19 on social media for more highlights from CAIS19.